It is increasingly common for train operating companies to enhance their mobile customer journey with the development of new apps and e-ticketing, all being enabled and supported by wifi connectivity in the trains and stations. Unfortunately, increased phone usage leaves more and more passengers with very little battery, increased anxiety and until now, no method of recharging. 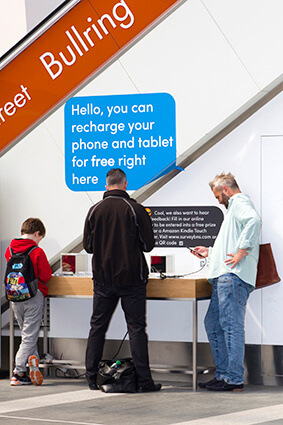 ChargeBox have combined the new locker-less solution, The Qube, with a custom built table to provide charging in four zones throughout Birmingham New Street Station. Whether passing through or catching a train, users can now grab a quick boost!